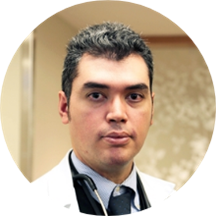 Dr. Michael R. Coronado is a dedicated cardiologist, caring for patients within the Newton-Wellesley Physician’s Cardiology practice located in Newton, Mass. Dr. Coronado received his medical degree from Boston University. He completed his residency in internal medicine at Beth Israel Deaconess Medical Center and his cardiology fellowship training at Boston Medical Center. He is board certified in internal medicine. Dr. Coronado is committed to staying abreast of the latest advancements in cardiology, and Dr. Coronado and his staff are dedicated to creating a positive experience for every patient in his care. Dr. Coronado’s practice is affiliated with the Elfers Cardiovascular Center at Newton-Wellesley Hospital, which offers the newest technology imaging systems for early diagnosis of heart disease as well as community-based prevention programs. This multidisciplinary Center is a clinical collaboration with the Massachusetts General Hospital Cardiology Division and is dedicated to the early diagnosis, evaluation, treatment and rehabilitation of patients with cardiovascular disease. Dr. Coronado’s special interests include device management and pacemakers. Dr. Michael R Coronado, MD has no appointments on Zocdoc right now.